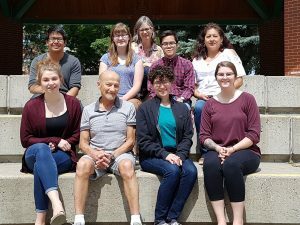 This year we are again lucky to have a large number of people helping with the Blackfoot Language Resources website. Front row L-R: Brittany Wichers, Don Frantz, Natalie Weber, Shelby Johnson. Middle row L-R: Blaise Russell, Mahaliah Peddle, Inge Genee, Myles Shirakawa, Rachel Hoof. Not pictured: Amanda Thom and Dan O’Donnell. We took this picture on a beautiful afternoon in the Galt Gardens park in Lethbridge.